When was my rifle made? After 1921, Remington employed a “date code” system which consists of a series of letters identifying the month and year of manufacture. This date code is typically 2-3 letters hand stamped on the jacket head (refer to the photograph below for location). The first letter in the code represents the month, the second (and sometimes third) letter represents the year. It is not uncommon for these letters to be stamped sideways. 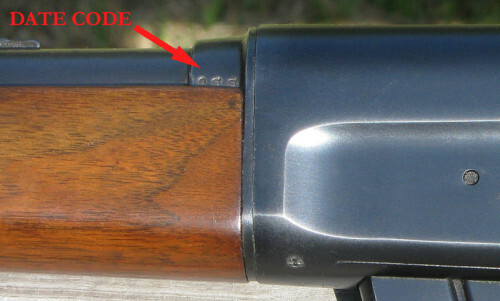 When a rifle was returned to Remington for a repair, the factory would stamp a repair code. These codes read the same as the date code, but were followed by a “3”. It is not uncommon to find the “3” stamped backwards. For those rifles manufactured prior to 1921, rifles not found with a date code, or rifles found with ONLY a repair code, these will be dated best by using the serial number list at the bottom of the page.